Hi there, we are having a heat wave! In the high 80's and low 90's. It feels like I am back in So Cal, since the humidity is low too. After running errands, I had some time to sit down and make a few cards this evening. This card was inspired by Fusion Card Challenge, Cupcake Inspiration, and Muse and will be entered to all three challenges. I stamped the Avery Elle Floral Bouquet stamps and leaves for alcohol marker (color-it) coloring. I colored them very simply with two colors each. Afterwards I fussy cut and darkened the edges with a black marker. I mounted the flowers as doubles for dimension. The cover-plate is quilted by Lawn Fawn. The sentiment is from Simon Says Stamp. 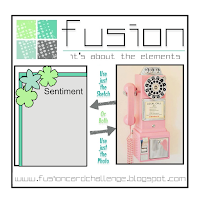 From Fusion I took the sketch, and from Cupcake I loved that front double pink shade, from muse I was inspired by the colors. I had stamped quite a few flowers and leaves, so I had some left over for this card which will also go to the Cupcake Inspiration Challenge and Muse. The cover plate and sentiment are both from PTI. ETA: I was a bit confused that my cards didn't show at the Muse gallery. Tonight I figured it out. I linked them to Addicted to Stamps and More, on their photo week. I got an honorable mention for the first card. I often have several challenges open when I prepare my blog posts, I must have forgotten to add this one in to my post. Here is the lovely graphic. Oh wow--these are just beautiful, Cat! Love the pink flowers & fun to see what different looks you got using the different backgrounds! Enjoy that nice weather before the humidity starts! your flowers are lovely and those two backgrounds set them off so well - especially love the design of the first card. Two beautiful cards, Cat! I love your choice of flowers and how you used a different background on each card...so pretty! Thanks so much for playing along with us at Fusion! Very elegant card! 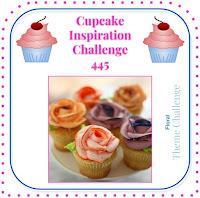 Thank you for playing along with our challenge over at Cupcake Inspirations. What beauties! I can't choose a favorite, they are both gorgeous.Thank you for playing over at Cupcake Inspirations. Hugs, Ishani. Very on trend! Two gorgeous creations! Very cute cards. I love that quilted background!! And that color is one of my favorite colors!! I love that quilted cover plate with the pink peeking though - gorgeous with your beautiful blooms! Two totally different looks with the same floral image! Beautiful, Cat!! Love both of these background cover plates too. Big congrats on the HM, Cat!